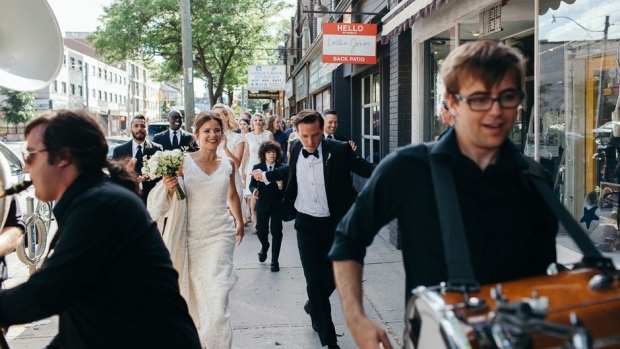 A Toronto couple wanted to give their whole community a chance to share in the joy of their wedding day, so they hired a local brass band and paraded through the streets. Diana Wright, 30, and Evert Houston, 35, sealed their vows with a kiss in their Leslieville backyard Sunday afternoon, before leading about 75 wedding guests through their house, out the front door and all the way to the reception restaurant. Hogtown Sound, a band that Wright heard busking downtown, blasted out tunes like “Uptown Funk” and “Get Lucky” on trumpets, saxophones --- even a sousaphone -- while Houston and Wright led the dancing in their formal attire. At one point, they passed a pub with an open window and the patrons toasted the newlyweds. The idea for a procession was inspired by a parade that Wright, a singer, saw in New Orleans. Houston, a film producer, liked the idea, which he said reminded him of a scene from a Federico Fellini film. Besides, they like “any excuse to dance,” according Wright. “We were born to dance together,” Houston concurred. 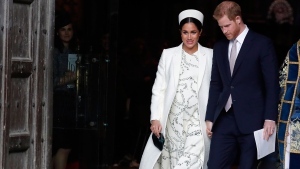 In the days after the wedding, the couple noticed how many neighbours had participated, based on the videos and comments shared online. Sherry Lynn Petrie, a neighbour, said she was watching news about deadly Orlando nightclub shooting on TV when she heard the band playing and went down stairs to watch and listen. It lifted her spirits. “The love and happiness just landed literally on my doorstep,” she said. “I'll never forget this moment and how I was profoundly touched,” she added. Petrie filmed a short video and posted it on a neighbourhood Facebook page.